Recognizing cancer as a group of diseases caused by nanostructural problems (i.e. with DNA) and also that there are unique benefits to approaches inherently involving nanoscale structures and processes to treat the disease, the journal Cancer Nanotechnology aims to disseminate cutting edge research; to promote emerging trends in the use of nanostructures and the induction of nanoscale processes for the prevention, diagnosis, treatment of cancer; and to cover related ancillary areas. 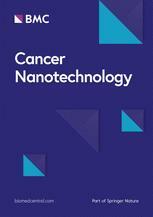 Articles describing original research in the use of nanostructures and the induction of nanoscale processes for the prevention, diagnosis and treatment of cancer (open submission process). Review, editorial and tutorial articles picking up on subthemes of emerging importance where nanostructures and the induction of nanoscale processes are used for the prevention, diagnosis and treatment of cancer. The journal went open access in 2014, which means that all articles published since then are freely available online.